Gardens of London | So Many Exciting and Beautiful Places! Mark and I left Minneapolis around 11:00 pm, headed for London Heathrow. The flight was delayed about an hour because of mechanical difficulties. We’ll spend a couple of days in London, and then leave for Paris via The Chunnel. After a few hours of sleep, we were roused around 5:30 am our time, 11:30 am London time. Aside from being late, the flight was mostly uneventful. We did experience some choppiness when flying over the eastern US, where it’s been rainy. We arrived at our hotel a little before 3:00, a Doubletree near Hyde Park, actually across from Kensington Gardens. Original plans were to go to Kew Gardens this afternoon, and do the London Eye tonight. Exhaustion and time constraints convinced us to keep it easy, so we walked to the Notting Hill neighborhood and had a bite to eat at Ruby Jean’s Diner. A couple sandwiches and ginger beers improved our energy level, and we explored the local area. The streets are quite busy, lots of people out and about on a Saturday evening. Most of the shops nearby seem to cater to the tourist – lots of “things and stuff” stores – inexpensive and cheap trinkets, second-hand clothing, “going out of business” sales, and cafes. It’s great for people watching. We enjoyed seeing how people create green space around their homes. Yards are small, but laid out beautifully with shrubs and flowering plants. We then walked through Kensington Gardens for a while. This place will be very busy tomorrow with the Royal Parks Half Marathon, which will go through Kensington Gardens, Hyde Park, The Green Park and St. James Park. The event raises money for the Royal Parks Foundation and other charities. We walked by the Round Pond where there were many swans, along with geese and ducks. The swans are especially impressive. They are not afraid of humans, and came up to us hoping to be fed. Just like the geese back home in Minnesota. The 2015 Rugby World Cup is being hosted by England at Twickenham Stadium. There are posters everywhere announcing the fact. 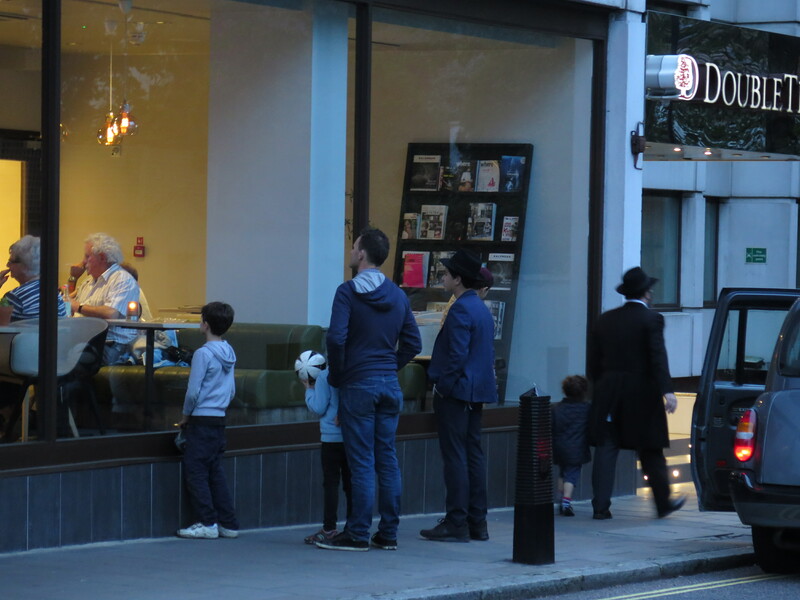 When we walked by our hotel this evening, we saw several men and boys watching the game through the windows of the hotel lounge. Today’s game was Australia vs Wales. Australia won 15-6. Next we walked to Queensway, a street celebrating many nations and cultures, we heard dozens of languages. We saw Thai, Russian, Indian, Italian, Persian, Chinese and more, bars, restaurants, groceries and shops, even a hookah bar. These were interspersed with McDonald’s, Burger King, Pizza Hut, Subway, Starbucks and other US restaurants. It’s been a full day (day and a half). This entry was posted in Europe, Kensington Gardens, London, Ruby Jean's Diner. Bookmark the permalink. Be sure to keep us up on your miles covered…we can compare it to Chicago! Looks like you’re off on a great adventure…thanks for taking us along!